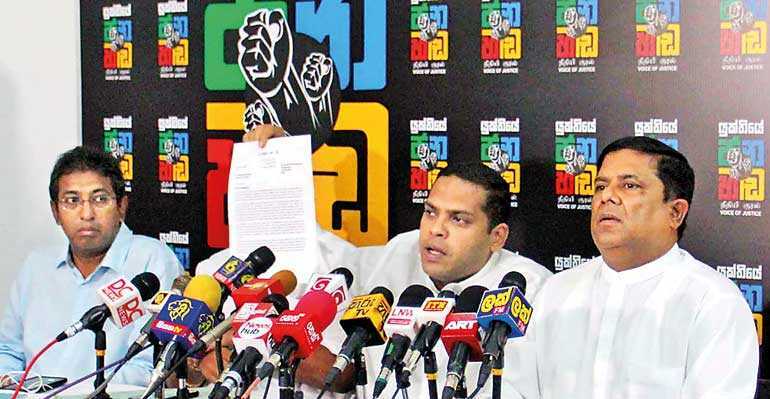 In a fresh turn in the maze that is the country’s current political crisis, the United National Party (UNP) yesterday made fresh claims over Manusha Nanayakkara’s support, as the ministers of the Cabinet which existed before 26 October 2018 hurried to reclaim office. Nanayakkara is said to have resigned from his new post as the Deputy Minister of Labour and Foreign Employment in the Sirisena-Rajapaksa Government. With Nanayakkara failing to come before the media to declare his support to Prime Minister Ranil Wickremesinghe, the UNP pulled out all the stops to ensure that the crossover was seen as authentic. A video clip of Nanayakkara in discussion with Wickremesinghe was shown at the press briefing to announce the crossover, held at Temple Trees last morning. Another clip of Nanayakkara giving a statement pledging his support to the democratic process was also shown. A letter purported to be the resignation letter tendered by Nanayakkara highlights that the Sirisena-Rajapaksa Government has neither been accepted by the Speaker nor the international community. “You are well aware that no international country has recognised the perpetrated Government that we took oaths in. This has certainly provoked my democratic conscience and I have seriously discussed this with my political affiliates and followers and come to the view that I cannot in any way be party to such illegal and unconstitutional acts. As such I forthwith tender my resignation in keeping with my democratic and political beliefs and conscience,” the letter reads. The letter has been submitted and accepted by the Presidential Secretariat, UNP spokesperson Parliamentarian Harin Fernando said. Following his resignation, Nanayakkara is said to have left for Singapore early last morning. “There are people who are worried about the repercussions and will only act on the day of the vote. They remember the dark days and you will see a number of such MPs on 14 November, the day of the vote,” he said. Fernando, the Telecom and Digital Infrastructure Minister of the Sirisena-Wickremesinghe Government, also claimed that there were a number of others who crossed over who are waiting to return. United National Front strongman Rajitha Senaratne, labelling the Nanayakkara crossover a victory, claimed that the tide was turning in the battle for democracy. Gaining momentum from the move and embolden by Speaker Karu Jayasuriya’s statement - which clarified his stance on the issue, giving weight to the opinion expressed to him in writing by the majority of parliamentarians - the Minister of Public Administration and Management and Law and Order in the Sirisena-Wickremesinghe Government, Ranjith Madduma Bandara, yesterday issued a letter to all ministry secretaries and heads of institutions instructing them not to take orders from any member of the Sirisena-Rajapaksa Government. The letter - copies of which were sent to the Speaker, President’s Secretary and the Prime Minister’s Secretary - also warns that following such orders will result in disciplinary action against the officials and those who issue orders, with steps taken to recover losses through surcharges imposed on parties involved. In a letter to IGP Pujith Jayasundara, Bandara instructed that the security given to the Prime Minister and the ministers of the Sirisena-Wickremesinghe should be reinstated without delay. “I have sent the statement given by the Speaker and ordered him that he should give the legally appointed Prime Minister and the ministers due security as the Law and Order Minister. I am informing all government servants who are spending money illegally that this will result in surcharges being slapped against them, so we request the officials to work according to the instructions given by our Cabinet,” Bandara said while speaking at a press conference held at Temple Trees. “The President has to take responsibility for the confusion created,” claimed Bandara, who failed to offer a way out for government servants.